In a few days I hope to be camped in the hills for the first time this autumn. Thinking of this here's a piece I wrote for The Great Outdoors a few years ago. Sitting outside the tent one evening gazing at the brilliant night sky I realised just how much I relish the coming of autumn and winter, especially for the camping side of backpacking. Summer camps are not often ones for enjoying the view. If it’s calm the midges are likely to be biting. If it’s stormy you want to be under cover. Sunset and sunrise are so close that to see both means only a few hours sleep. And those are times when the midges are often at their worst too. Unless it’s raining and the sun is hidden. Watching the stars doesn’t feature in summer backpacking either. To see them you have to stay up late – and, yet again, cope with the midges – and even then the sky never seems fully dark. Generally in summer it’s light when I fall asleep and light when I wake. Come the first frosts and all this changes. The nights are lengthening, the midges are disappearing. Soon no sleep need be lost to see the sun set and the sun rise. Night skies are truly dark too so the stars are bright when it’s clear. Once past the equinox there’s no need to be asleep in daylight. Indeed, it’s best not to be as there’s no longer seemingly endless time for walking, the one boon of summer. 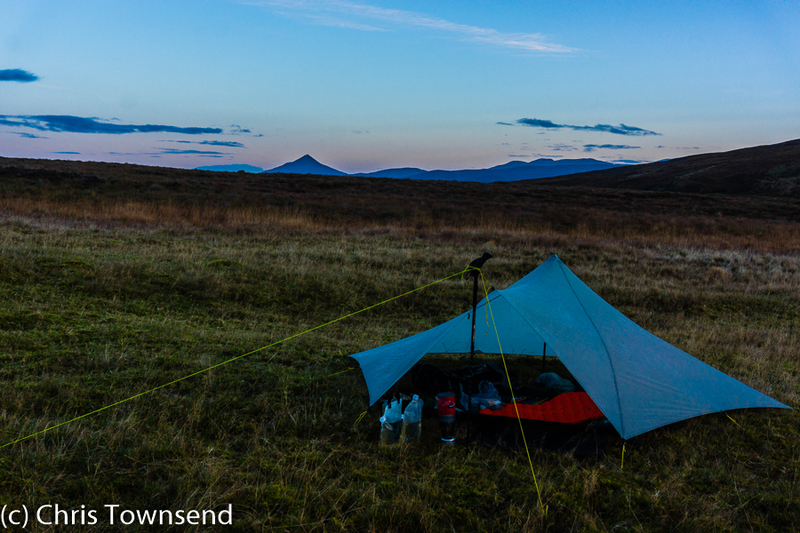 At this time of year I’m often up before dawn and not making camp until dusk. 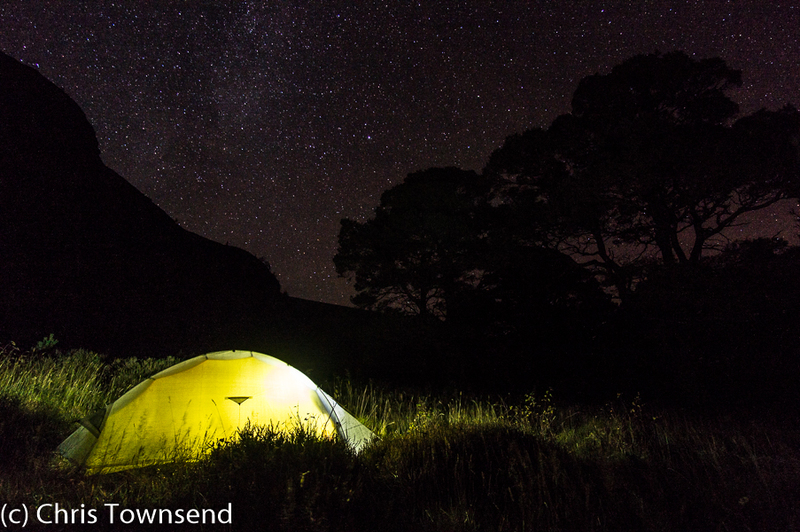 Camping is a different experience without the midges too. No need to cook in a steamy porch with a mosquito coil filling it with fumes and condensation running down the walls because outside the midges are battering themselves against the flysheet. No need to lie sweating in a zipped up double-skin tent on warm humid nights. In autumn and winter I only close the outer door when the weather is stormy. 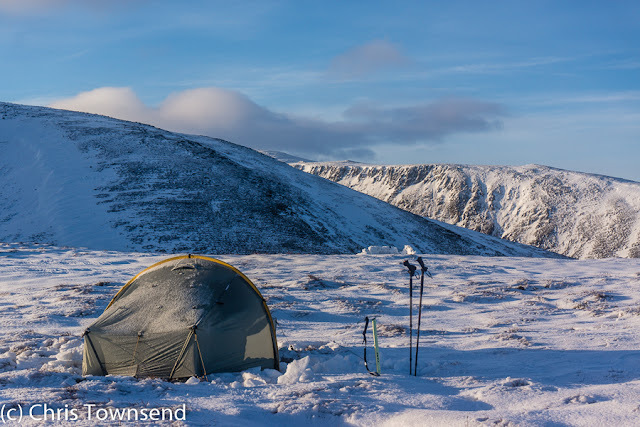 The inner tent door stays open unless spindrift is blowing in. In fact I often don’t have an inner door as I use just a flysheet or tarp and a groundsheet, enjoying the freedom this brings. I feel more in touch with the world than in summer through not having to seal myself inside. The choice of campsites expands too. 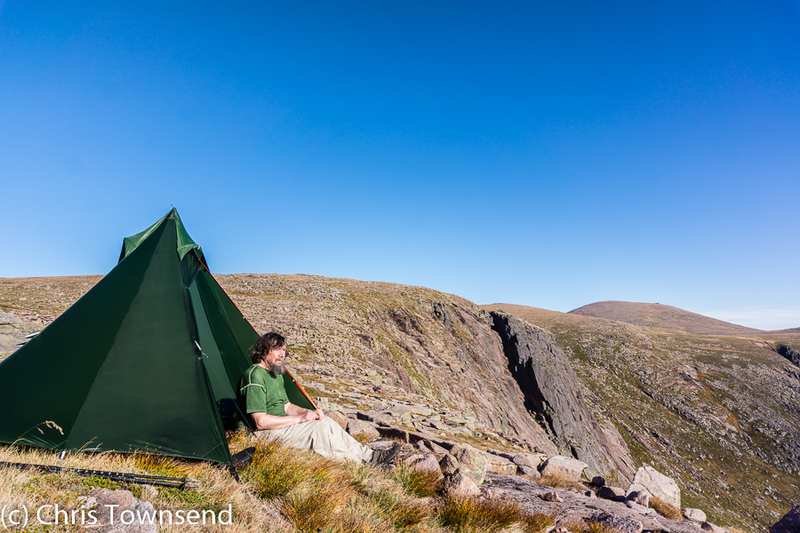 In summer I avoid camping in forests or sheltered spots and seek out places that are breezy in order to try and avoid the midges (but always aware that if the wind drops they will appear instantly). Now I can venture deep into the trees and know I can sit outside the tent watching them as they become silhouettes as night falls. Summer is usually seen as the season for camping because it’s the warmest time of year. I prefer autumn to spring though and not just because of the lack of midges. Yes, it is colder, sometimes much colder and with snow, but the right clothing and sleeping equipment deals with this. I prefer anyway to feel slightly chilly than too hot. The crisp touch of frosty air on the face is enlivening. Waking to see a frosty world is stimulating and exciting too. I love watching the first rays of the sun touch the summits and then slowly move down towards my camp. The landscape glows and warms as the sun sweeps over it, coming to life and sparkling in the brightness. The colours of nature become more varied and interesting in autumn too. Late summer they are uniform, a mass of green and brown. Once the leaves and grasses start to turn yellow and orange the woods and hills are brighter and more distinctive. On frosty days the sky is a deeper blue, without the haze often found in summer. Then as autumn turns to winter and the colours fade as the snow falls, changing the landscape again and creating a monochrome world that is just as beautiful. 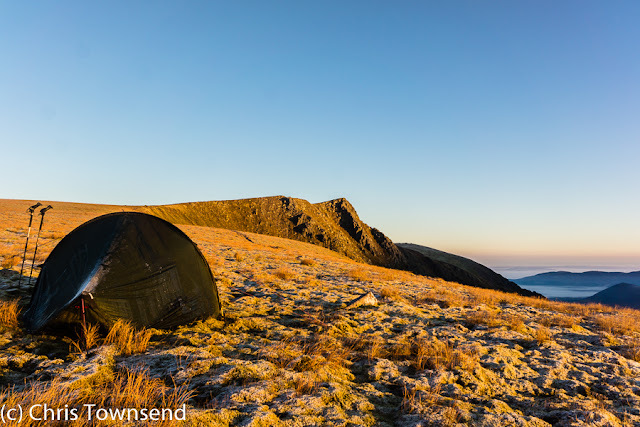 Im going camping up at llyn edno on the moelwyns in snowdonia this weekend and looking forward to it for all the same reasons as you chris.cooler,less midgies less day light and much comfier night sleep all round.nice fresh mornings to look forward to too. I agree. I'm currently backpacking around the Pyrenees and its just glorious. Warm in the sun, but a fair nip in the breeze, especially in the mornings and evenings when it rises indicating the coming winter. The air is so clear and fresh it just feels healthier. Several people have asked if I'm cold in my tent, but like you I prefer to be slightly chilly - the summer heat can't be escaped. I emailed a friend recently how camping harmonises with our circadian rhythms, I automatically wake before sunrise and feel drowsy soon after sunset (who needs a watch?). Later I then read in the news about the Nobel prize science winners' work on circadian rhythms and how they can affect our health. I wonder if they're keen backpackers? 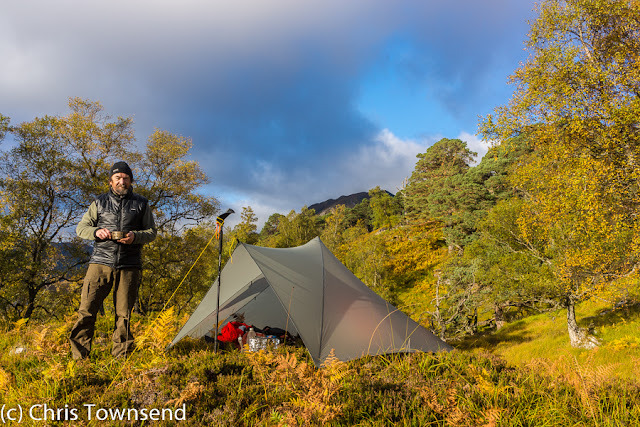 I postponed the Cape Wrath Trail this spring, maybe an opportunity in disguise to enjoy it one autumn? I love autumn time, should take more time for camping during autumn. Thanks for posting this.